STARRING Greta Scacchi, James Wilby, Anthony Way, Joan Plowright, Nigel Le Vaillant, Florence Hoath and Penelope Wilton. SYNOPSIS A modern adaptation of Phillipa Pearce's classic children's story. Tom Long is forced to stay with his aunt and uncle while his brother is unwell. Brought to a very old house, which has been turned into flats, Tom finds it has no garden. 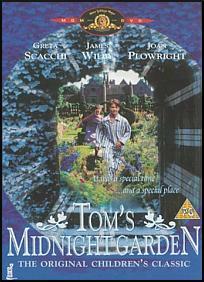 Disappointment turns to wonder as the hall clock strikes 13 and Tom discovers a magical garden, where time stands still. There he meets a Victorian family and becomes friends with a young girl named Hattie. Tom's lonely isolation is over, but how long can he make it last before he must go home.